Marguerite Levin is a sought after musician and teacher in the Greater Boston area. 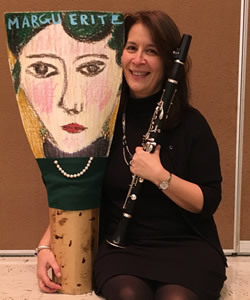 She is clarinetist with North Winds Quintet, Cape Ann Symphony and performs often with the Baltimore Symphony, Symphony New Hampshire, Boston Ballet, Glens Falls Symphony and the Lexington Symphony. She is on faculty at Northeastern University and the New England Conservatory Preparatory Division. Before coming to Boston she was a tenured Associate Professor at Towson University in Baltimore, Maryland, and previous to that position, she was on faculty at Howard University in Washington, D.C. teaching clarinet, chamber music and music theory. A native Texan, Levin moved east in 1986 to assume a position with the United States Navy Band in Washington, D.C. Following a four-year post with the band, she embarked upon a successful career as free-lance clarinetist in the Washington, D.C./Baltimore area. She was Principal Clarinetist with the Baltimore Opera Orchestra from 1999 until its 2009 insolvency. She performed with most of the renowned ensembles and orchestras in the Washington area, including as Principal Clarinet of Wolf Trap Opera’s 2010 Grammy nominated recording of John Musto’s Volpone. Levin recorded for many years with the Washington Winds, a group that records at Omega Studios in Rockville, Maryland for the major music publishers of American wind band literature. She can also be heard as a member of the Post Classical Ensemble in their 2007 Naxos recording of Virgil Thomson’s The Plow That Broke the Plains and The River. A highly successful teacher, Levin’s private students have received positions in District, County and State bands and orchestras in Texas, Virginia, Maryland, and Massachusetts. Many of these students continued their music education in college and received notable scholarships to universities such as the Cincinnati College/Conservatory of Music, Indiana University, University of Virginia, Peabody Conservatory, and the New England Conservatory of Music. Her private student of six years, Ralph Skiano is currently the Principal Clarinet of the Detroit Symphony. Several others are based in select military bands in Washington, D.C., Quantico, and Ft. Dix, N.J. At Towson University, her students received some of the department’s most notable awards including First and Third Prize in the Peggy Friedman Gordon Competition. Levin is an active member of the International Clarinet Association. She was the sole Artistic Director of the 2004 ClarinetFest in College Park, Maryland. She has adjudicated in the Young Artist Solo Competition, the High School Solo Competition and the Research Competition. She served as Coordinator of the ICA High School Solo Competition from 2009-2011. In addition, she has contributed 2 CD reviews and a 1997 article/interview on the Dallas and Ft. Worth Symphony clarinet sections in the association’s professional journal, The Clarinet. ClarinetFests© that she has performed in include Lubbock, Salt Lake City, College Park, Atlanta, Austin, Tama, Japan, Porto, Portugal and Assisi, Italy. Levin received her Bachelor of Music degree in Music Education from the University of North Texas under Dr. James Gillespie. She earned her Master of Music degree in Performance from the Catholic University of America under Robert Genovese and Leon Russianoff. Her Doctor of Music degree in Performance was received from the University of Maryland/College Park under Loren Kitt. Other noted clarinet teachers include Andrew Crisanti, Stephen Girko, and Edward Palanker.